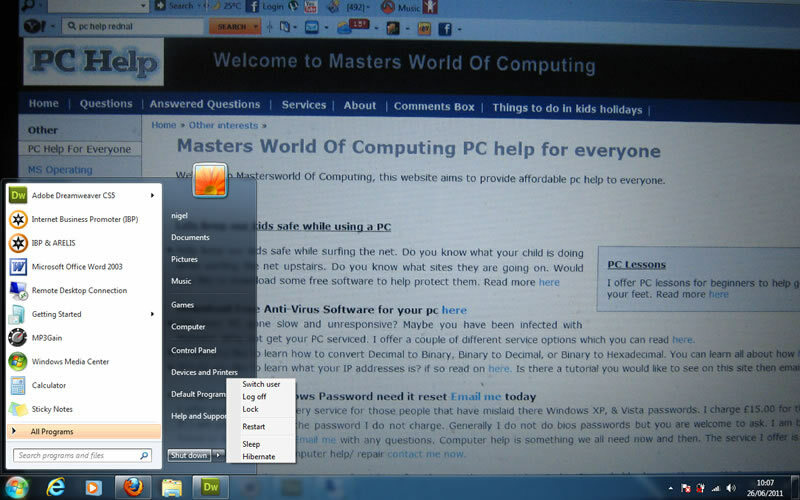 I will show you in Windows 7 how to switch between users without logging the other user off. This is quite a simple thing to do so click on Start located at the bottom left corner of your screen. Then move your cursor to the little arrow next to the word "Shut down" and left click. This will open a drop down menu as you can see in the screenprint below. Now left click with your mouse on "Switch user" this will take you back to the login screen which will give you the option to log a different user on. When you go back to your own user account it will be in the same state you left it. Remember this the more users you have logged on at the same time will slow your computer down. If this tutorial has helped you please consider leaving feedback by clicking here it help others by letting them know that it worked. Remember if you can not find what you are looking for then you can email me here or simply request a tutorial on my comments page here. If I think I can help I will. I am based from home in Rednal Birmingham if you think there is something I can help with get in touch. In the meantime here are just a few of my Windows 7 tutorials on offer.